This International Women’s Day, we at GlobalStep wanted to do more than just wish the wonderful ladies at GlobalStep. We wanted to go one step further and ask them to don the creative hats and give us their perspective on characters in video games. With women making up close to half of the gaming population and with some of the top gaming studios being led by women, we felt it was about time! We circulated a questionnaire with some basic character-related questions to GlobalStep’s women employees across our global offices, and the passion with which they responded surprised even us! Through their answers was born “Justicia’. This is the story of what we asked them, what they answered and how Justicia was created. What would be your character’s weapon of choice? If you thought that our woman character would need a big weapon to help her and showcase her strength, you couldn’t have been more wrong! Bare hands are enough for Justicia to show her adversaries what she’s made of! If your character had a superpower, what would it be? Sorry Superman, the ability to fly didn’t find much love from the women at GlobalStep! They chose a superpower that they could use not only in fighting crime but also personally to jet set across the world – the ability to teleport! Because why restrict yourself – clever choice, women of GlobalStep! What is your character’s strongest characteristic? Smartness and quick thinking beat physical strength, speed and agility. The women of GlobalStep felt that a woman smart and able to quickly think on her feet can change anything in the world and manipulate any situation to suit it to her advantage! What colour would be dominating your character’s outfit? If you thought Justicia was going to be dominated by pink, it’s time to break through the stereotypes, just like the women of GlobalStep did. Every option they chose had a logic and representation behind it, that really gives character to Justicia. We went with a bold red that symbolizes her strength and aggression, with just a royal touch of gold to show her royalty and grace! What is your character’s main motivation? 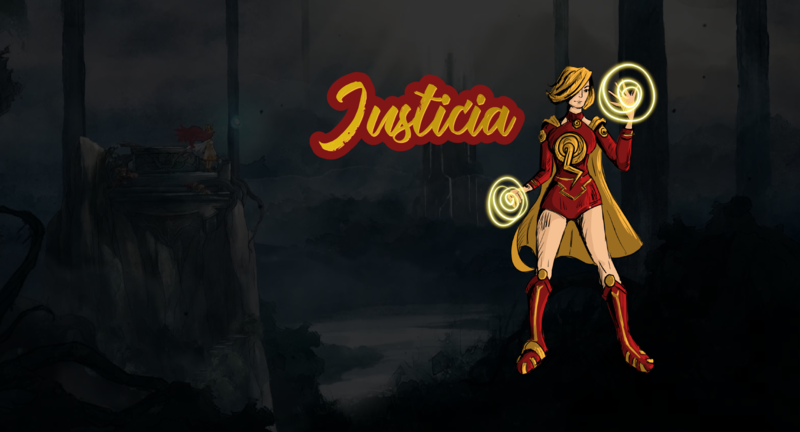 Unlike most video game characters that are a part of a heist, assassination squad or motivated by personal vengeance and loss, Justicia chooses to fight for the right things in life! By fighting against injustice and lawlessness, she aims to make the world a better place for everyone in it! We heard you, The women of GlobalStep! And we hope Justicia lives up to your expectations! She could also have had some interesting names – such as Crimson, Untitled Ranger, Kaileena and more! But we went with the one that was closest to her one motivation – of bringing justice to everyone! A huge thanks to all the women at GlobalStep for responding to the survey! Justicia is a character that has a part of each of you, and represents what you stand for in a lot of ways!